Jeff Green picked up the 98th last-place finish of his NASCAR XFINITY Series career in Saturday’s VisitMyrtleBeach.com 300 at the Kentucky Speedway when his unsponsored #93 RSS Racing Chevrolet fell out with a vibration after 16 of 200 laps. The finish, which came in Green’s 474th series start, was his ninth of the season, his first since Richmond earlier this month, and his third in five races. 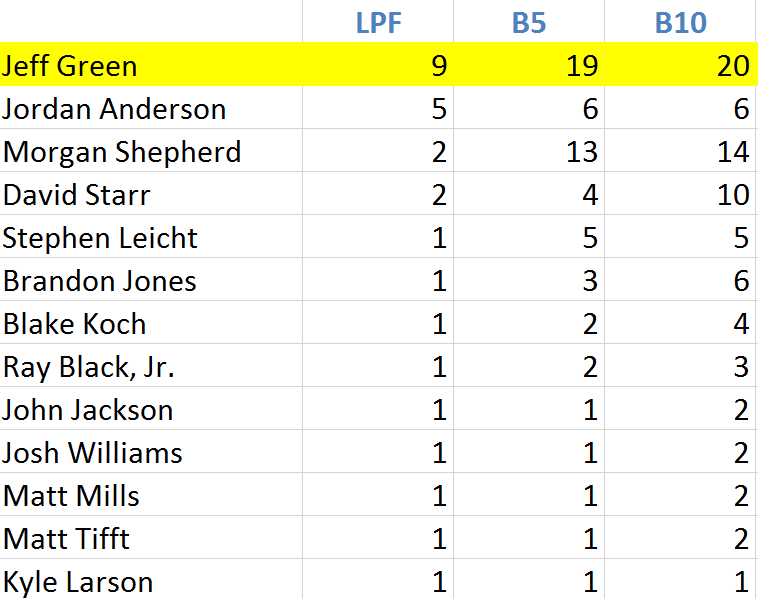 With six races to go, Green now carries a four-finish lead over Jordan Anderson for the 2017 LASTCAR XFINITY Series title. 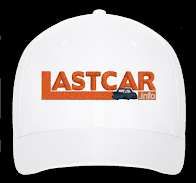 He also leads Anderson by an insurmountable 19-6 in Bottom Fives, and is virtually assured of his record-breaking sixth LASTCAR title. 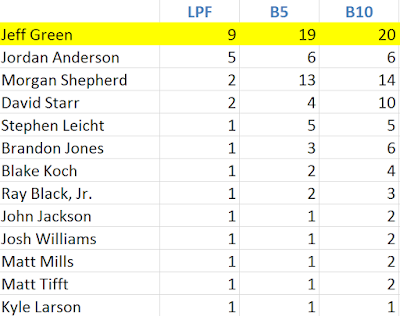 Green will officially lock up the title with one more last-place finish in any of the remaining races, or if Anderson fails to finish last next Saturday at Dover. Anderson has not started an XFINITY Series race since the series’ last trip to Dover in June. Green didn’t participate in Friday’s opening practice, then turned seven laps in Happy Hour, earning the 27th-fastest speed of 38 drivers with a lap of 175.234mph. He lost some speed in qualifying, lining up 30th with a speed of 172.944mph, but with exactly 40 drivers entered to fill the field, would line up next to Quin Houff in Row 15. An unapproved tire change, however, would drop Green to last for the start of the race. 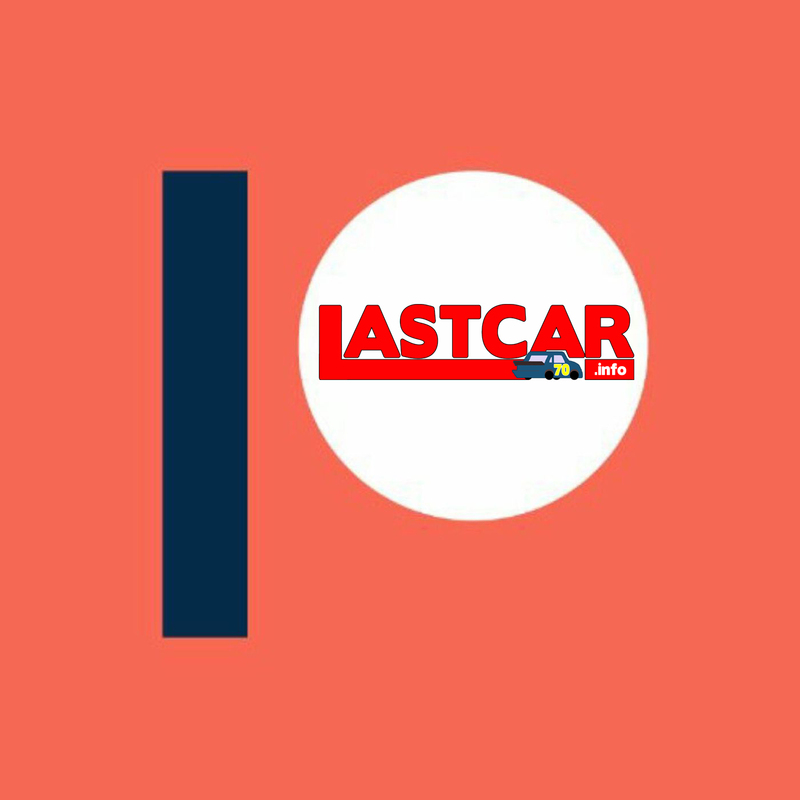 Joining him would be Justin Allgaier, whose JR Motorsports team made unapproved adjustments to the #7 Brandt Chevrolet. Originally scheduled to start last was owner-driver Mike Harmon, whose #74 Dodge turned in the session’s slowest lap of 160.480mph, two-and-a-half seconds slower than Green and more than four full seconds behind polesitter Kyle Benjamin. However, Green was sent to the rear during the pace laps for an unapproved tire change, and Justin Allgaier’s #7 Brandt Chevrolet followed suit after his JR Motorsports team made unapproved adjustments to the car. 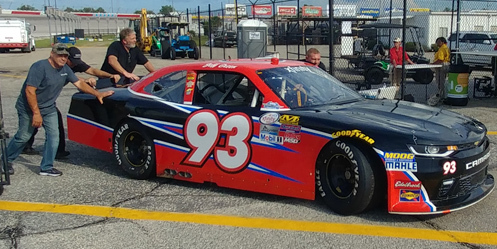 Coming to the green flag, more cars also fell to the rear: Morgan Shepherd, whose #89 Visone RV Chevrolet was to roll off 36th, and 31st-place starter Korbin Forrister in the #07 Spectrum Autism Support Chevrolet for SS-Green Light Racing. As the field rolled by the cameras in Turns 1 and 2, Green was again lined up in the last spot, following both Shepherd and Forrister. On Lap 2, Forrister had re-taken last from Green, and the #93 had climbed to 36th on his new tires. 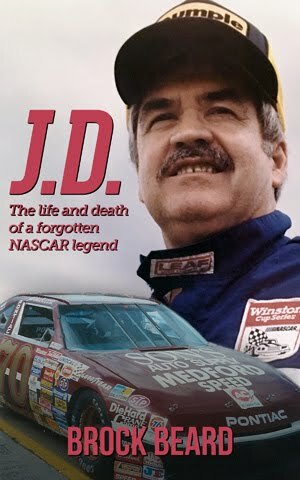 By the sixth lap, Green was 33rd, and last had fallen to 39th-place starter John Jackson in Motorsports Business Management’s #40 O.C.R. Gaz Bar Chevrolet. By the time the broadcast had returned from commercial break, Green had pulled behind the wall under green. Finishing 39th was Carl Long, who for the first time this year drove the #72 debuted at Loudon by Jackson (though this time a Toyota in place of Jackson’s Dodge). 38th went to Dexter Bean, who had to pull to the apron of the tri-oval in order to avoid the fast-closing leaders putting him a lap down. Behind Bean’s #92 BuckedUp Apparel / CrashClaimsR.us Chevrolet for King Autosport was Morgan Shepherd, who pulled in just ahead of Bean on the same lap. Rounding out the Bottom Five was Timmy Hill, who dropped into the Bottom Five after Mike Harmon returned from the garage after fuel pump repairs (ultimately climbing to 34th before his own DNF). *This marked Green’s fifth last-place finish in an XFINITY Series race at Kentucky, but also his first since 2015, back when he was driving for TriStar Motorsports. 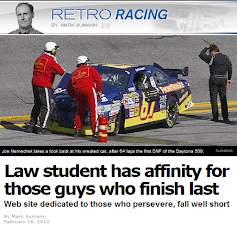 The previous three last-place finishers at the track were Matt DiBenedetto, Mike Bliss, and Brandon Jones. Nicely written article. it has all the necessary details on needs to fill their selves with. Thanks for such a detailed post. Look forward to reading more.